24-year-old Grant Chupinka thought he was getting a Penguins jersey, but ended up getting so much more. On Monday morning, 24-year-old Grant Chupinka, a cancer patient, left the hospital after receiving positive news from his doctor that his tumor was shrinking. To celebrate, his parents took him to PPG Paints Arena in Pittsburgh so Grant could take in the Penguins’ morning skate and pick-up a jersey at the rink. He ended up chatting with goaltender Matt Murray while he was there before Sidney Crosby came up and surprised the Chupinka family and stayed for a visit. 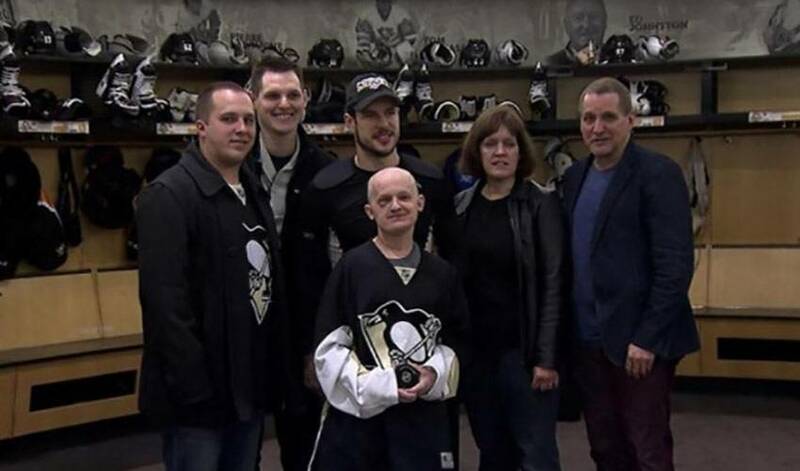 They toured the locker room, chatted about fantasy hockey and Crosby surprised Grant with a signed puck and stick to go with his autographed jersey. Learn more about the history of the Ted Lindsay Award, and the trophy's namesake, Ted Lindsay, a key figure in the creating of the original National Hockey League Players’ Association and a Hockey Hall of Fame member who skated in 17 NHL seasons. Will it be No. 87, No. 88 or No. 97 that receives this year’s Ted Lindsay Award? Before the winner is revealed on June 21, check out some of the big-time numbers posted by this trio of NHL talents. The 2017 Stanley Cup has been decided as the Pittsburgh Penguins skated away with hockey’s ultimate team trophy for the second straight season and fifth time overall. There were plenty of prime time performances throughout the Playoffs, including these five players who topped the charts in points. Burns, Crosby and McDavid were voted "Most Outstanding Player" finalists by fellow players.